The first time I went to Niagara Falls I was absolutely awestruck ... and not because of the power and majesty of all that rushing water. My quirky wanderlust had brought me there in the first week of January, and the whole place was just covered in glittering ice. To my California eyes, it was a magical winter wonderland beyond what I ever could have imagined. With the falls-generated mist creating layers of ice on everything – trees, light posts, the iron scrollwork of the low fencing – it was straight out of a fairy take. And that the falls themselves in some places stood stopped in their tracks, literally frozen still, was just the surreal icing on the cake. It all led me down a winter-wonderland rabbit hole, where I stumbled upon many fabulous historic photos of the area beautifully gripped in freezing temperatures. While the falls of course have had a long history with the people who were there long before the Europeans and others came to town, the area started to became a tourist attraction in the 1820s, around the same time as the birth of the camera. Put two and two together, and voila: Photos of the frozen falls during the Victorian and Edwardian eras. 1859: (Above) Niagara Falls in winter, seen from Goat Island. Luna Island stands in the middle of the cascade, known as the American or Rainbow Falls, and Prospect Point can be seen in the background. 1865: (Below) Great Ice Bridge and American Falls, Niagara Falls, NY, USA. 1866: Niagara Falls frozen below Table Rock. 1883: People on snow-covered ice at the base of the frozen American Falls, Niagara Falls, New York. 1885: Terrapin Tower and Frozen Fall, from Goat Island. 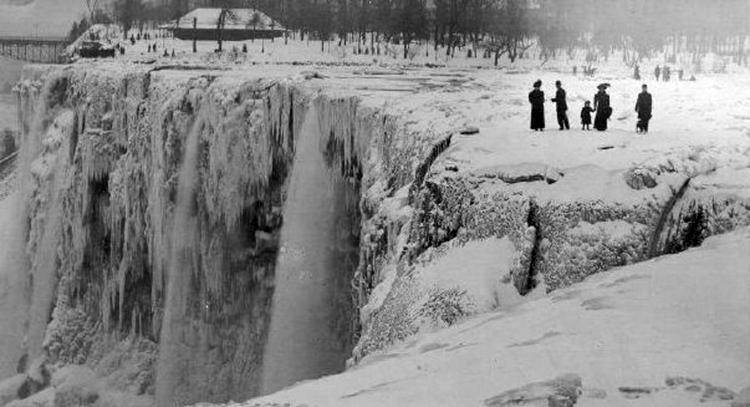 1890: Niagara Falls on the border between Canada and the USA in winter. 1890: Horseshoe Falls from the Canadian side. 1909: American Falls frozen over. 1911: Below the American Falls.